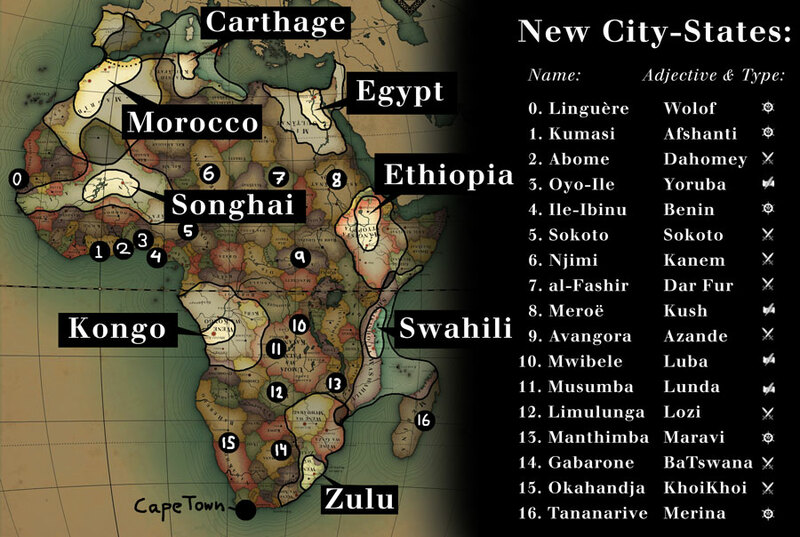 The emergence of African city-states began in North Africa with ancient Egypt and then later the formation of the Carthaginian empire. These civilizations are both heavily documented by written accounts, as are the other North African kingdoms of Numidia and Mauretania. However, apart from surviving secondhand accounts from early travelers from Egypt or Carthage, knowledge of city-states in the rest of Africa relies entirely on archaeological evidence. Carthage ruled the area around its capital through direct rule, and the remainder of its areas through client kings such as those of Numidia. The Numidians throwing their support behind the Romans at the Battle of Zama in 202 b.c.e. saw the defeat of the Carthaginians, setting the scene for the destruction of Carthage itself in 146 b.c.e. Numidia had a brief period of independence before it too fell under Roman control. 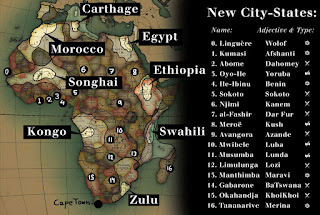 The most well-known African city-states outside North Africa are thought to have emerged in modernday Sudan and Ethiopia, with many settlements near the confluence of the Blue and White Niles, and ancient megaliths were found in southern Ethiopia. Gradually two city-states, those of Meroë (900 b.c.e.–400 c.e.) and Axum (100–1000 c.e. ), emerged, both transformed from powerful cities to significant kingdoms controlling large tracts of land, relying heavily on the early use of iron. The use of bronze and iron in war are also clearly shown by the location of some of these settlements. The remains of many ancient villages and small townships have been found in Sudan, which show that protection from attack was considerably more important than access to fertile arable land. The other area that seems to have seen the emergence of city-states in the ancient period was in sub- Saharan West Africa. The finding of large numbers of objects and artifacts at Nok in modern-day Nigeria, which flourished from 500 b.c.e., has demonstrated the existence of a wealthy trading city on the Jos Plateau. It seems likely that there would have been other settlements and small city-states in the region, with people from that area believed to have started migrating along the western coast of modern-day Gabon, Congo, and Angola, and also inland to Lake Victoria. The major African city-state emerging toward the end of this period was Great Zimbabwe. Its stone buildings, undoubtedly replacing earlier wooden ones, provide evidence of what the society in the area had developed into by the 11th century c.e. Little contemporary written material has survived about religious traditions in ancient Africa, except in inscriptions by the ancient Egyptians about their beliefs and in accounts by Herodotus when he described the religions and folklore of North Africa. The Egyptian beliefs involved gods and the monarchs as descendants of these deities and their representatives on earth. Many of the Egyptian gods have different forms, with some like Horus and Isis being well known, and changes in weather, climate, and the wellbeing of the country reflecting the relative power of particular contending deities. Briefly during the eighteenth Dynasty, the pharaoh Akhenaten (14th century b.c.e.) tried to establish monotheism with the worship of the sun god Aten. The move eroded the power of the priests devoted to the sun-god Amun-Ra, who struck back. After establishing a new capital at Tel el Amarna, the pharaoh died under mysterious circumstances and the old religion was restored and continued until the Ptolemies took over Egypt in the fourth century b.c.e., which saw the introduction of Greek gods, and later Roman gods when Egypt became a part of the Roman Empire. Although these concepts started in Egypt, similar ideas, almost certainly emanating from Egypt, can be found in Nubia and elsewhere. At Meroë in modern day Sudan, there is evidence of worship of gods similar to the Egyptians’. It also seems likely that similar ideas flourished for many centuries at Kush and Axum, the latter, in modern-day Ethiopia, influenced by south Arabia and introducing into Africa some deities from there. In Carthage many beliefs followed those of the Phoenicians. The deity Moloch was also said to be satisfied only by human sacrifice, with some historians suggesting that one of Hannibal’s own brothers was sacrificed, as a child, to Moloch. Modern historians suggest that the Romans exaggerated the bloodthirsty nature of the worship of the Carthaginian deity Moloch in order to better justify their war against Carthage and that the large numbers of infant bodies found by archaeologists in a burial ground near Carthage may have been from disease rather than mass human sacrifice of small children. The kingdoms of Numidia and Mauretania to the west of Carthage would have been partially influenced by Carthaginian ideas but later came to adopt Roman religious practices, both becoming parts of the Roman Empire. Much can be surmised about religious practices in sub-Saharan Africa during this period from the statuary found in places such as Nok, in modern-day northern Nigeria. Their carved stone statues of deities have survived, showing possible similarities with some Mediterranean concepts of Mother Earth. However, it seems more likely that ancestor worship was the most significant element of traditional African religion, as it undoubtedly was for many other early societies. Human figurines, as the hundreds of carved peoples of soapstone from Esie in southwest Nigeria and the brass heads from Ife are thought to represent ancestors, chiefs, or other actual people. At Jenné-jeno and some other nearby sites, the bones of relatives were sometimes interred within houses or burial buildings. As Islam came into the area, this dramatically changed the religious beliefs of the area. Islam led to the building of many mosques, with cemeteries located in the grounds of these mosques or on the outskirts of cities. The graves of holy men became revered and places of pilgrimage and veneration. In some places Islam adapted to some of the local customs, but in other areas, such as Saharan Africa, it totally changed the nature of religious tradition. In some parts of West Africa there was a clash between the fundamental concepts of Islam and tribal customs, but in most areas ancestor worship was replaced by filial respect for ancestors.